The vice president of Jet Pack International, Nick Macomber, has been reached hospitalized following a crash in Denver, Colorado according to SFGate. 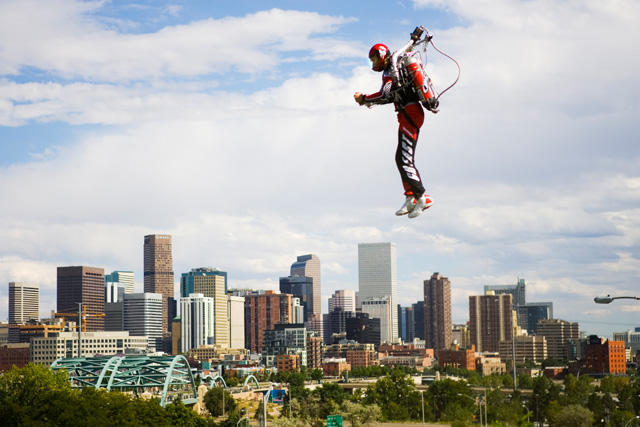 Macomber was flying a hydrogen peroxide-fuelled jet pack during a test flight near the Denver Energy drink company. He lost control of the back pack and fell 6m, landing on his head. "The guy was bleeding, he had head wounds where he had blood gushing on his face, he was spitting out blood, it looks like he had landed on his knees and he couldn't get up," said Alison McCoy who works next door at Premier Roofing and came running over moments after the accident. "They always have protective gear, helmet the whole shebang but nobody seemed to notice that this time," said McCoy. Macomber was admitted with lacerations, a broken jaw and burns, but has since been released from the hospital.